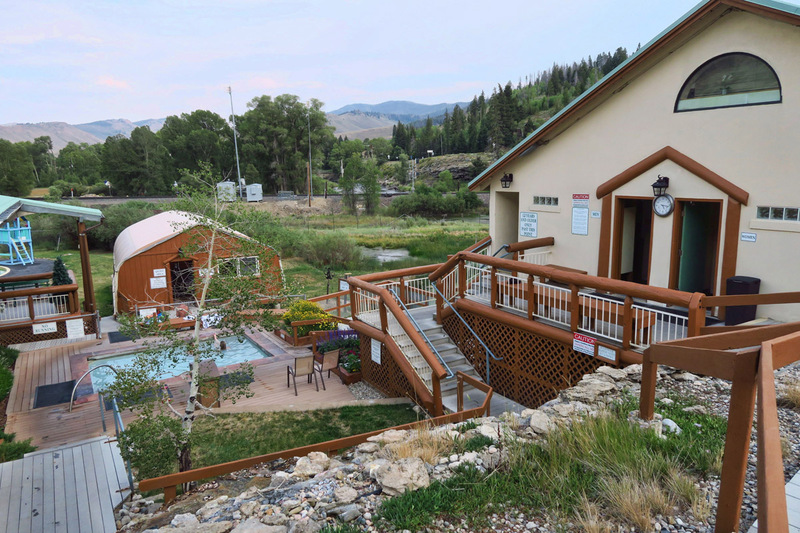 Turns out, there are seven natural springs providing over 200,000 gallons of mineral-rich water daily to a facility that gives the town its name, Hot Sulphur Springs. 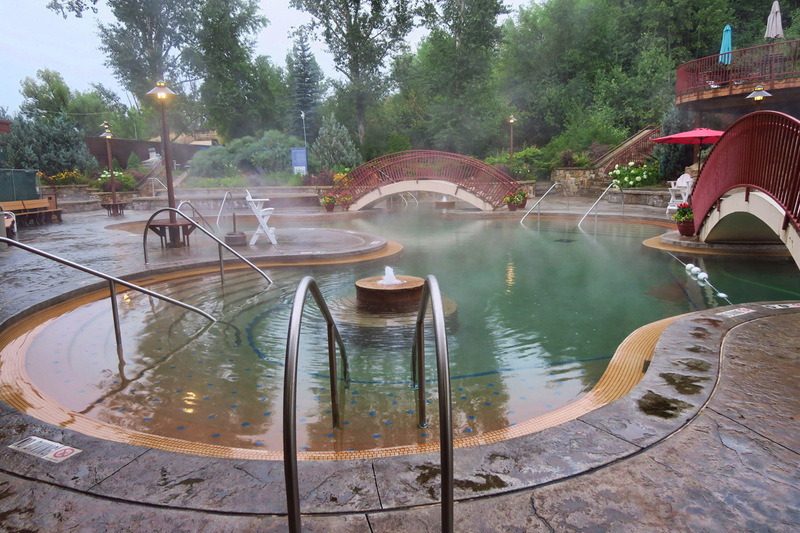 The Hot Sulphur Springs “Resort & Spa” has 21 different pools of varying temperatures for soaking. The absolute best part is that children are only allowed in four of those 21 pools, all on the lower level! Not having to share the pool with swollen, soggy swim diapers makes me a happy soaker! 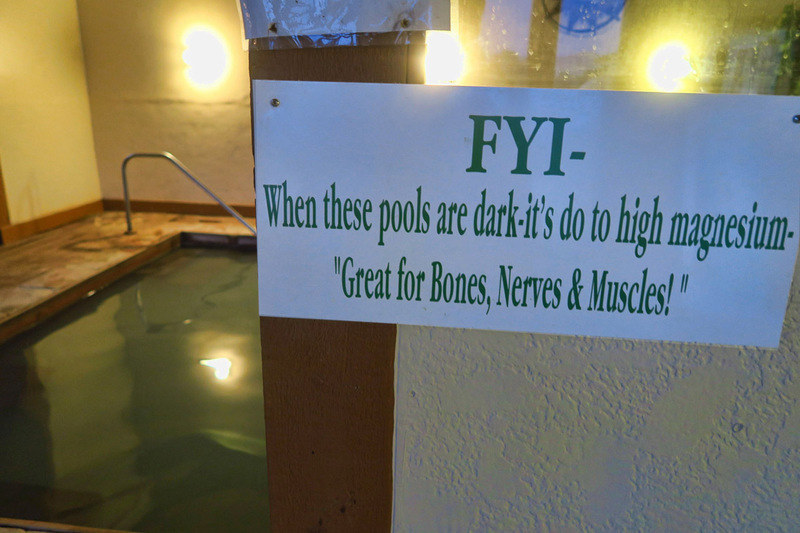 Hot Sulphur Springs facility has twenty one pools of varying temps. Some are large, with a more natural setting. Some are barely big enough for more than one, offering some privacy. Two are indoors, offering water with higher magnesium content. I hope they got a refund on this sign “do” (due) to the misspelling. Two of the lower pools where children are allowed. Down this long ramp to the right is my own private moment of Zen, the Zen Pool. Far away from everyone, and just the right size. Just over the railroad tracks is Pioneer Park, free county campground. The town of Hot Sulphur Springs is one of those “blink and you miss it” towns with an estimated population of around 700. There’s nothing there aside from the hot springs and a couple of hotels. 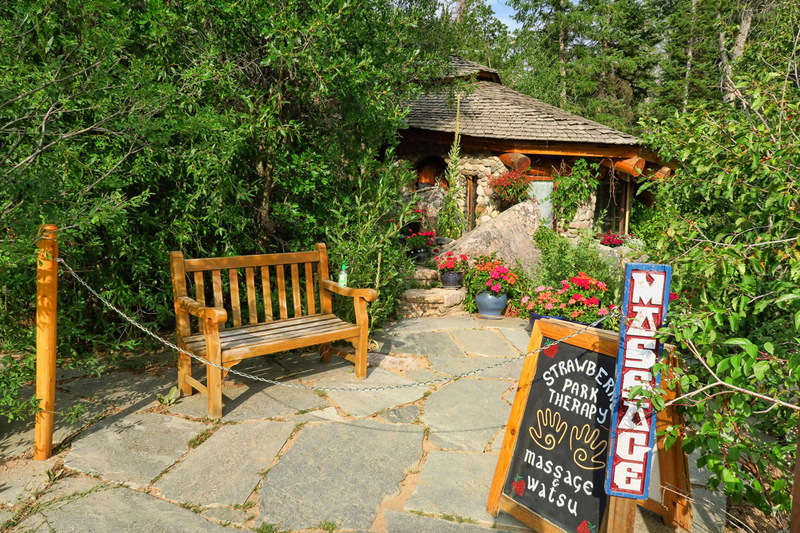 It’s hot when I arrive, so I want to park overnight so I can visit the springs when it cools down a bit. 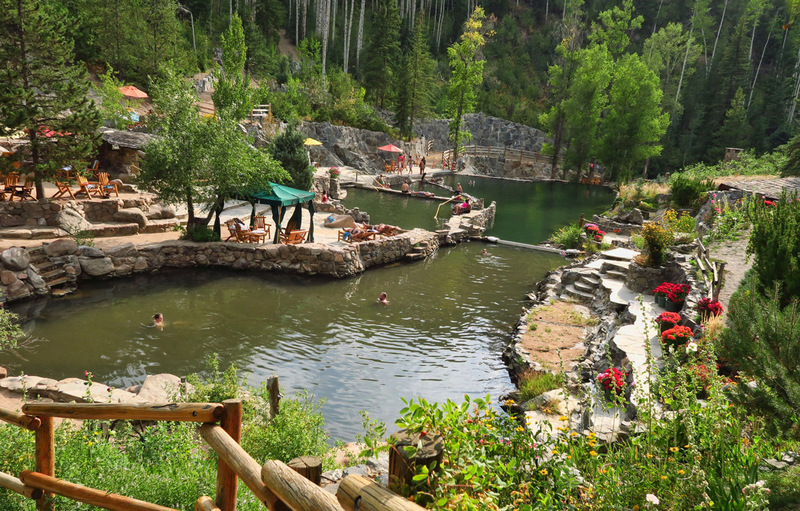 A little research reveals a county park within walking distance of the springs, and it’s FREE! 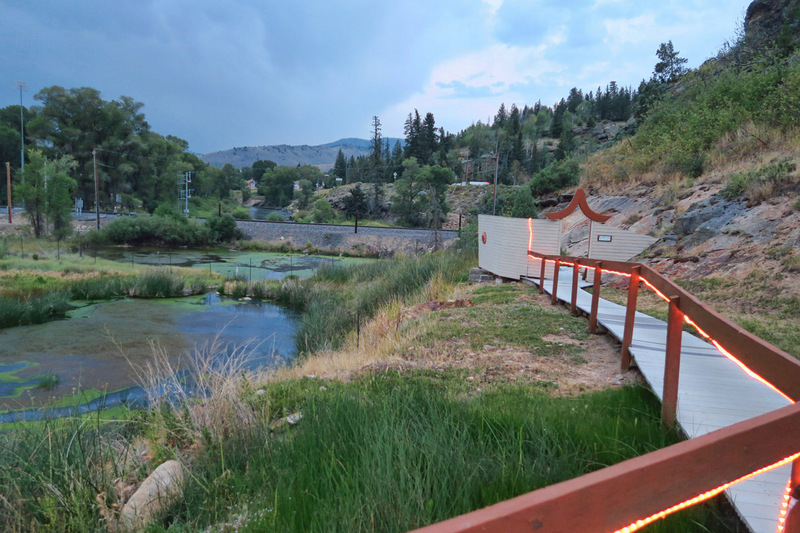 It’s an idyllic little park alongside the Colorado River. Very serene and peaceful, level, and somewhat private, with a cool breeze rushing down through the canyon, and tall cottonwood trees to provide shade. I find a spot next to a sweet older gentleman who is there to fish. He comes over to move some rocks so I can more easily back in. He will later provide comfort of a different sort, as I have a strange encounter on my way to the springs. A young man who appears to be homeless asks me for my receipt from the hot springs when I return so he can use it for its same day readmission value. I tell him I plan on staying until closing time, a comment I realize too late as being too much information. In the course of our brief conversation, he tells me not once but three times that he “just got outta jail.” I try to remain cool and nonchalant as I take leave as soon as possible trying not to appear to be bolting in fear. I am not sure why he felt the need to tell me this…was it for sympathy? He didn’t ask for money, only my receipt. Nor did he seem threatening. So why the jail talk? Needless to say, I took the long way home from the springs to avoid his campsite! It just makes me sad, as the free little county park will likely not be sustainable for long with those kinds of interactions. Otherwise, I would have stayed another night for the river ambiance alone. Moving along, my next destination is all about the hot springs. 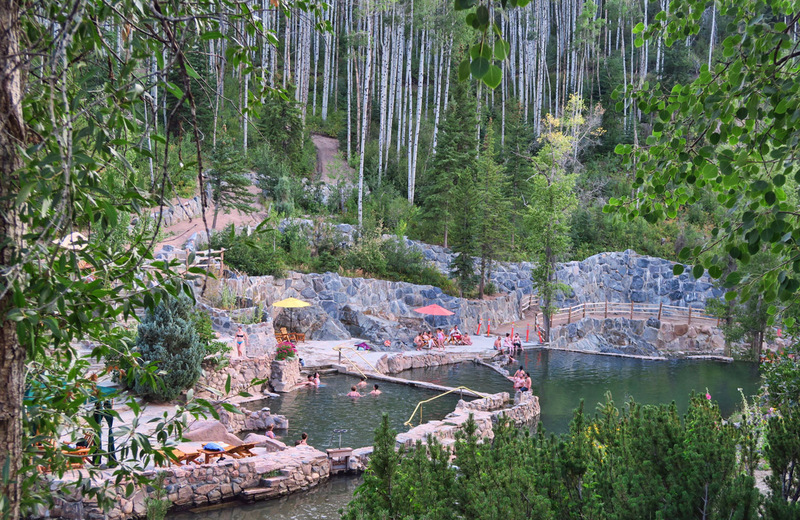 I have long heard that Strawberry Park, just outside Steamboat Springs is one of the nicest natural hot springs in the US. I have had it on my “must visit” list for years. I had even thought about taking the tent up the mountain to spend the night, as the road is reported to be too rough for the Winnie. Everything I have read about the springs proves to be true. 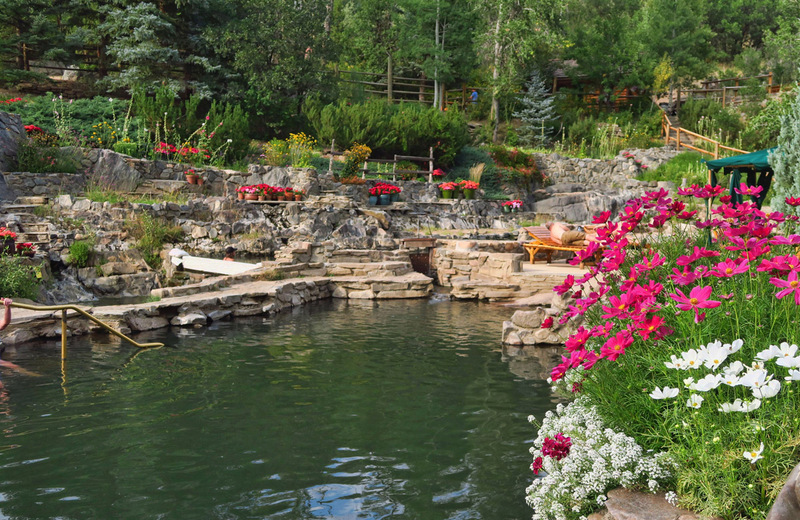 It’s lovely, relaxing, and beautifully landscaped. Although there are only four pools, they are all large, and therefore seem uncrowded. But there is another reason why Strawberry Park is relatively uncrowded. 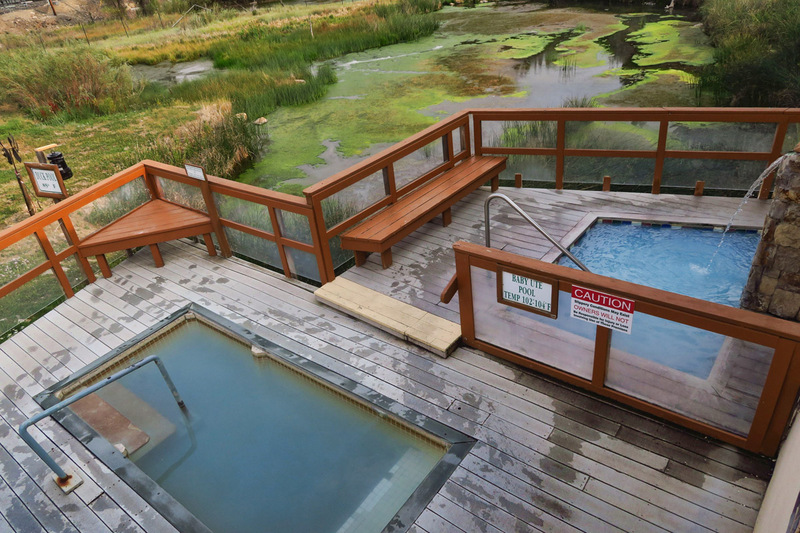 As their website promotes, the springs are “nestled alongside Hot Springs Creek.” There’s only one problem. 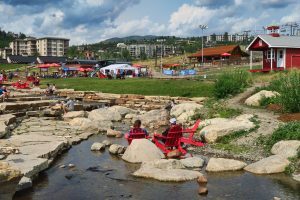 Due to the dry winter, lack of snow melt, and drought conditions in Colorado this summer, Hot Springs Creek is dry. 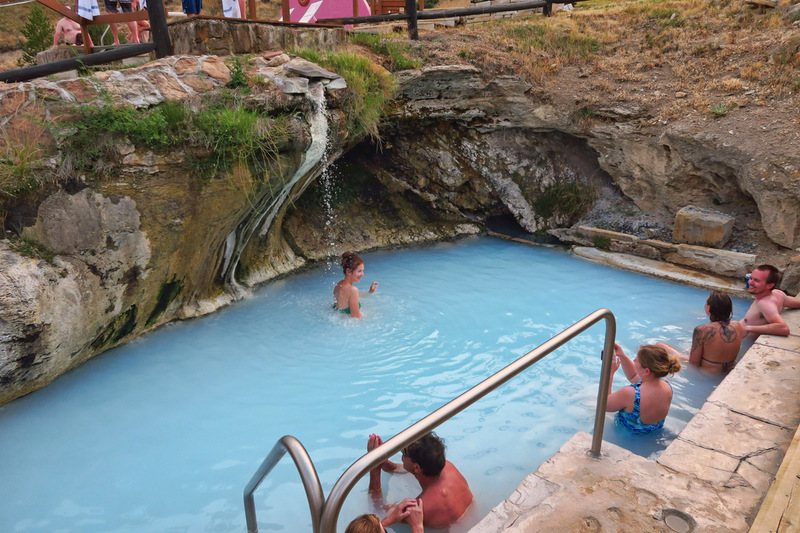 Normally, they mix the cool, refreshing water from the creek with the steaming hot water from the springs to offer a range of temperatures in the four pools. During a conversation with the maintenance guy carrying around a thermometer, I learn that I am not the only one who finds the water too hot. Typical temperature for the cooler of the pools is typically around 102°. Without the ability to blend in the cool creek water, they are 107° the evening I visit. Too hot for me, unfortunately, so I forgo my original idea of camping alongside the dry riverbed, as I am sufficiently boiled in one afternoon. Clever ticket booth at entrance to Strawberry Park. 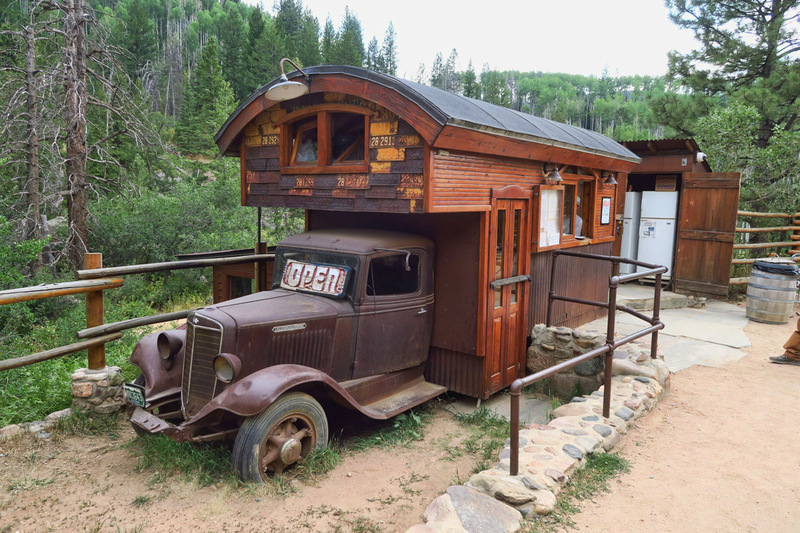 The road to reach Strawberry Park is gravel, a little steep, and some washboard stretches, but “doable” in most vehicles. Apparently from what I was told, the water is a bit muddier than normal due to the lack of clear, cool river water to mix into the flow. 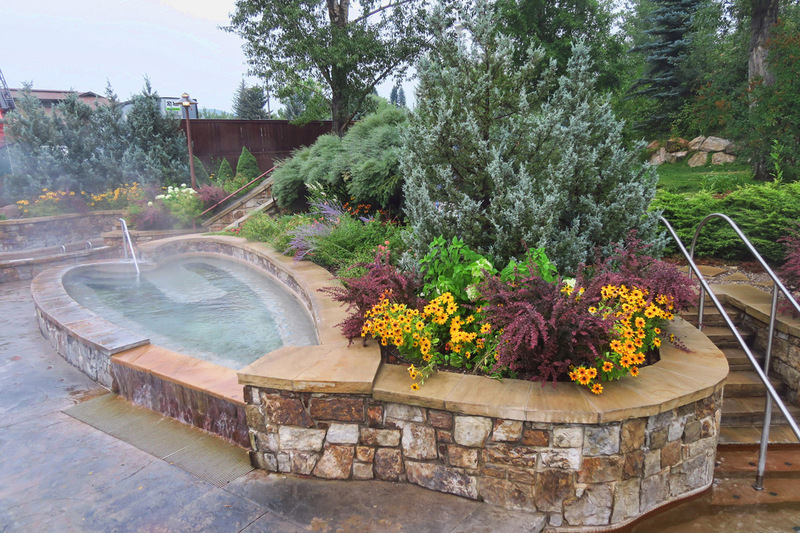 Another beautifully landscaped path to the massage facility. 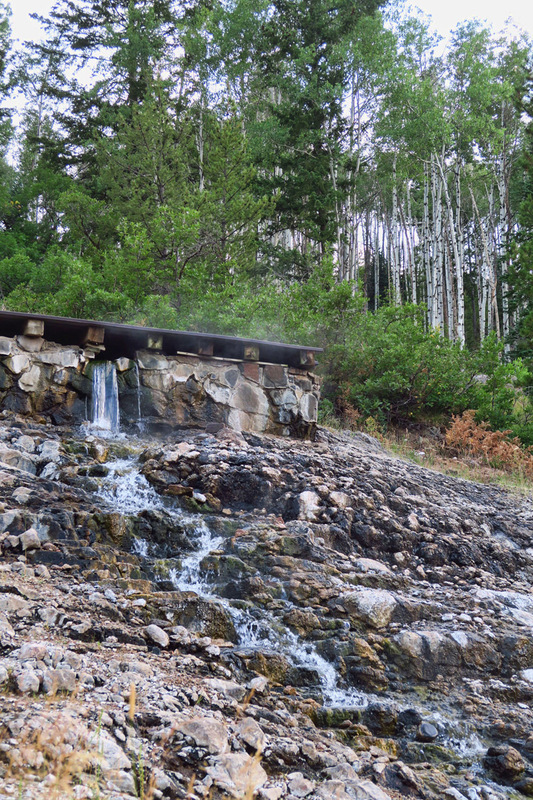 This is the source of the hot spring. Tough to tell here, but steam is rising from the vents. Lots of nice seating areas on the terrace above. Large aspen grove surrounds the springs. Can imagine it’s beautiful when the leaves turn gold. 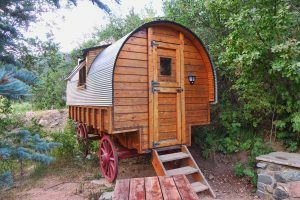 You can camp along the river, or stay in a gypsy wagon! Surprisingly modern restroom facilities for such a rustic location. I find with most hot springs, there is a “slack time” around 5 or 6pm, after the screamers have left, before the sundowners arrive. 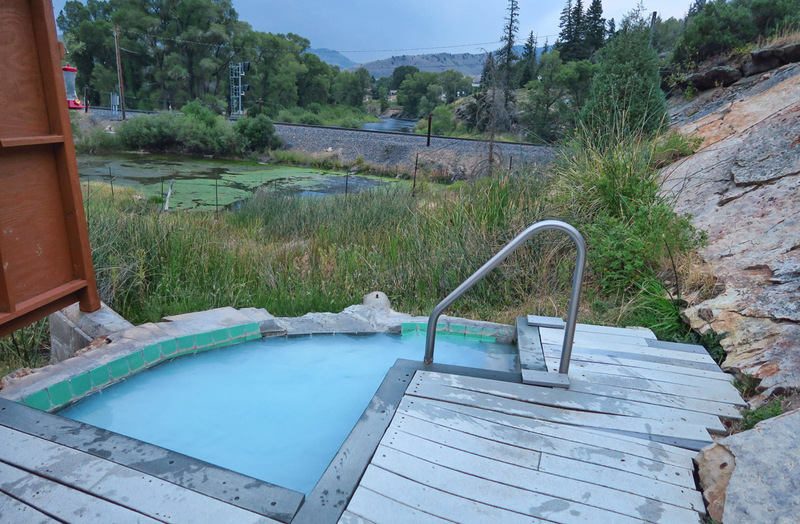 Another accidental discovery is that Steamboat Springs has not one, but TWO hot springs! 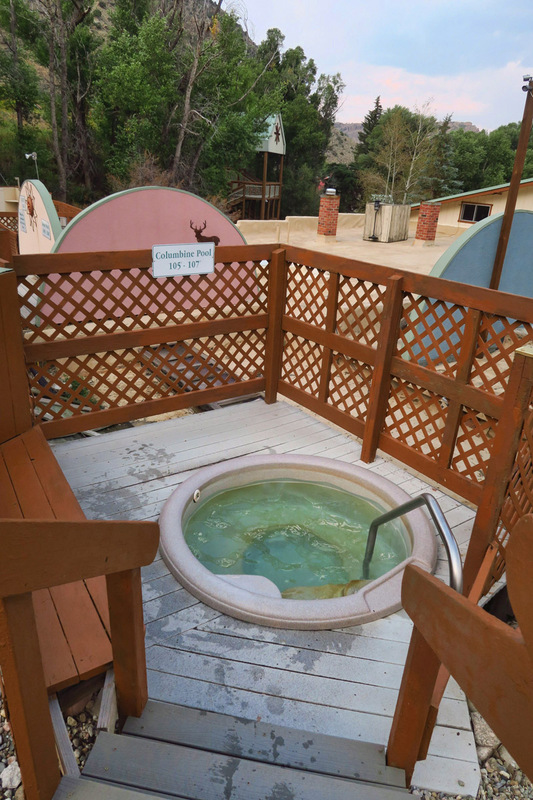 I had no idea until I was driving through that right in the middle of town is the Old Town Hot Springs. Fearing its potential to be a kids hangout with slides and a splash-in climbing wall, I set the alarm for 6:00am on a gray rainy day so I can be there when the doors open at 7:00am. 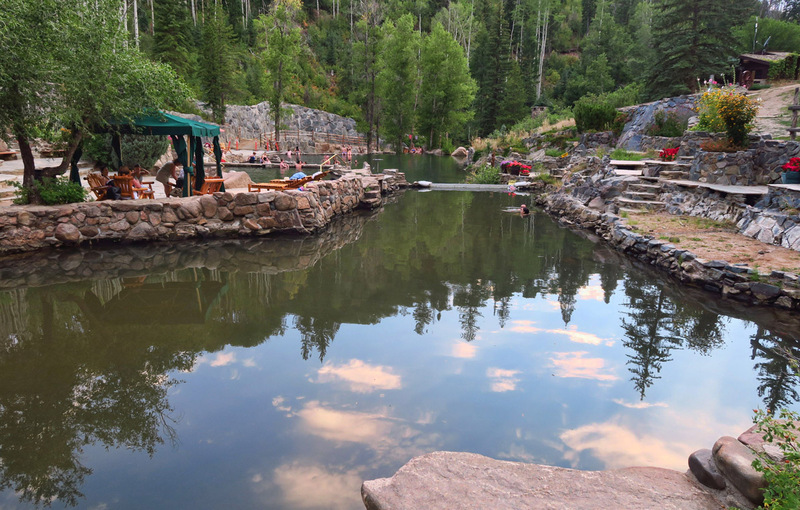 The best thing going here is the Heart Spring, a heart-shaped pool where approximately 220 gallons of 102°-103° pure mineral water is pumped from the ground per minute. This main pool feeds all of the pools at the facility. 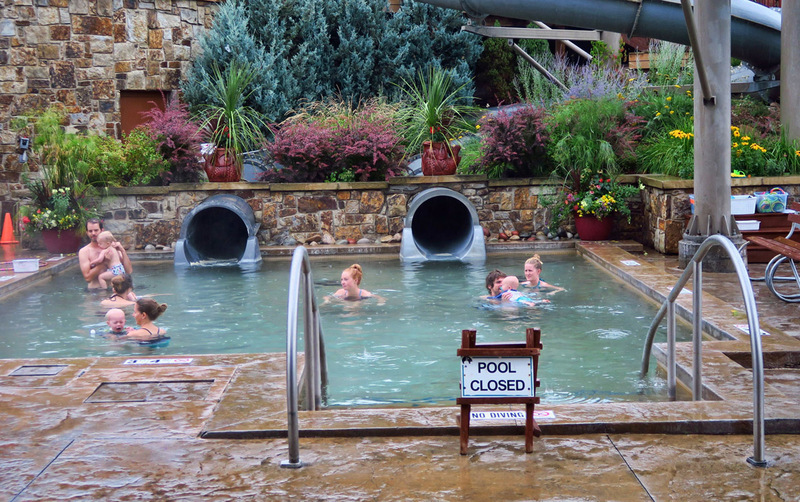 It contains no chlorine and no kids, as you must be 18 or older to enter the heart-shaped pool. It’s worth getting up at 6am to have this place all to myself. It’s a misty, rainy morning, where rising steam gives ethereal feeling. I had 45 minutes of sheer bliss before this happened….infant swim class. Well, at least they give them their own pool! 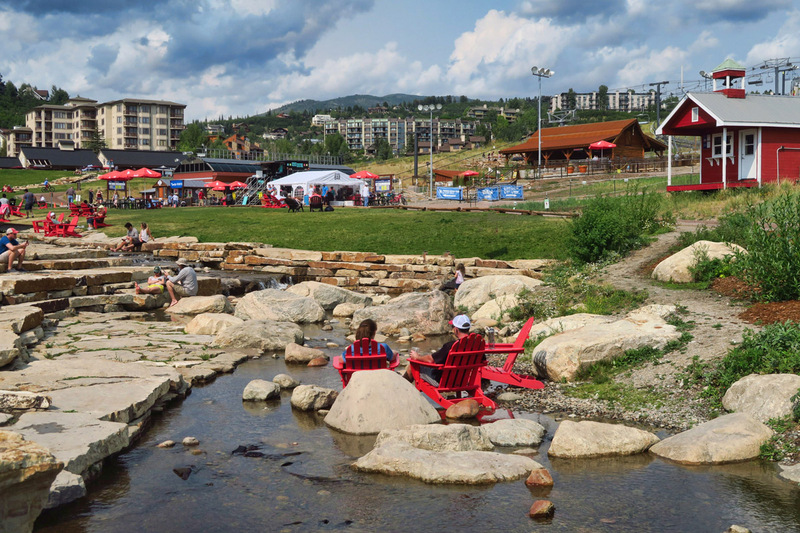 Steamboat Springs is a cute little town. 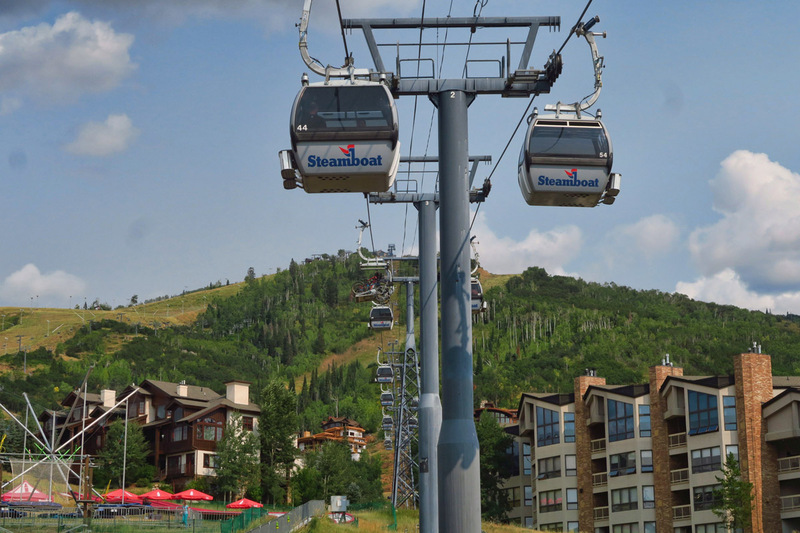 I think I would have enjoyed coming here to ski in my youth had it not been for its more remote location, less accessible than the Summit area or Utah’s Big and Little Cottonwood Canyons. 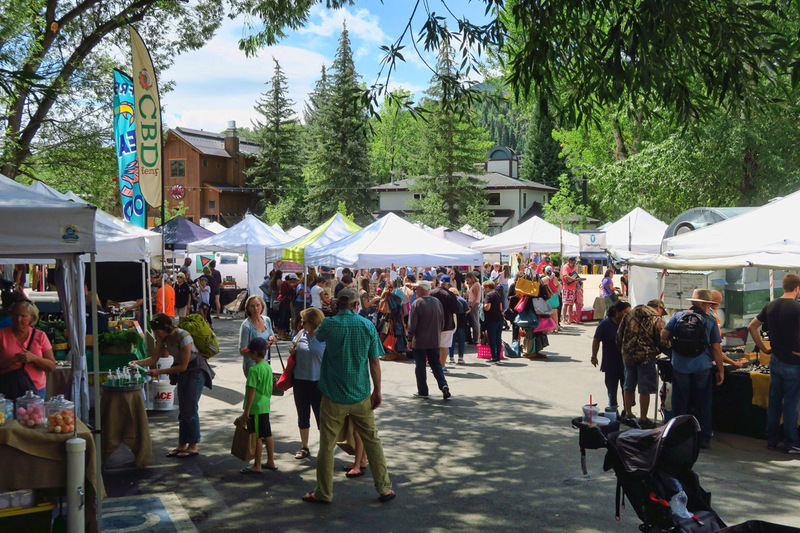 It’s got a lovely river path, abundant farmer’s market and a plethora of shops, restaurants and bars along its historic downtown. 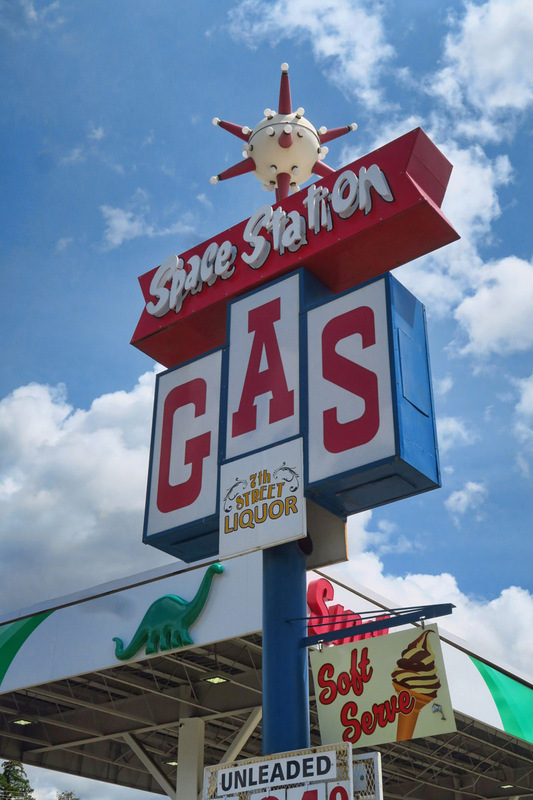 Love this old town landmark Space Station! I liked the looks of the ski area. 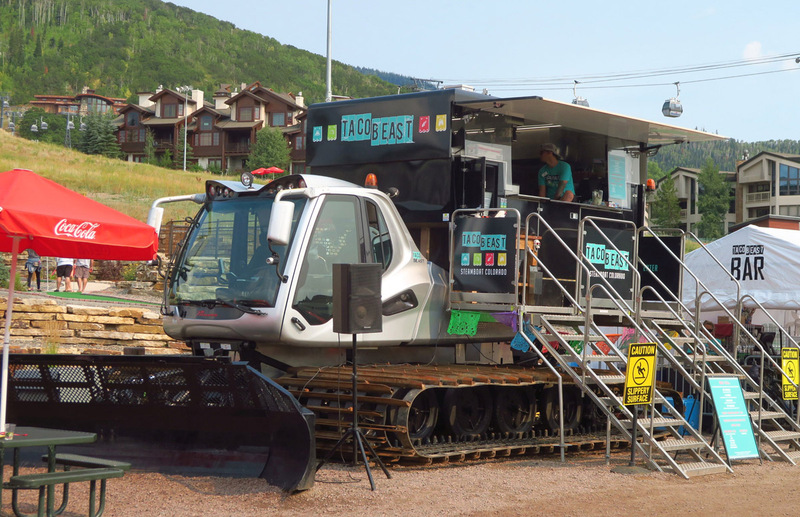 The “Taco Beast,” Steamboat’s version of the food truck! Although I have to say, the whole western thing started to get to me after a while. Almost like they were trying too hard to establish their cowboy identity. 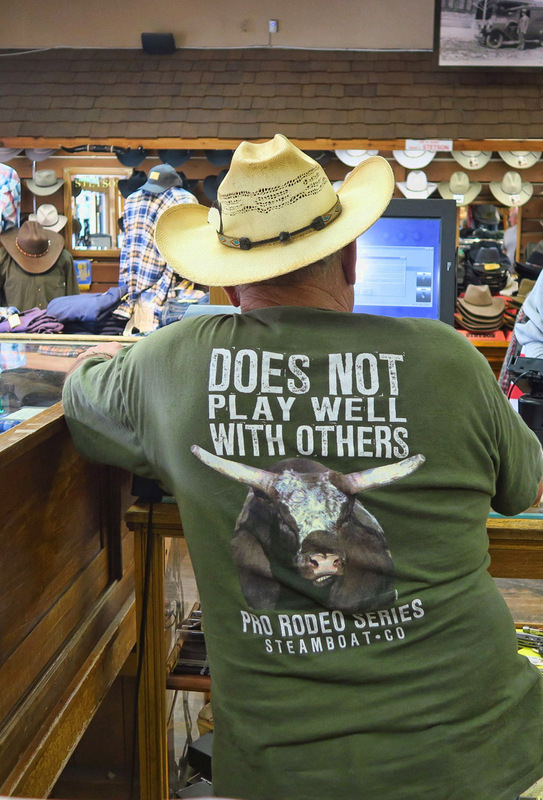 Especially the echo of twangy country music that permeates every one of those shops, restaurants, and bars, blaring out onto the sidewalks. Even the grocery stores and gas stations have the twangy tunes turned up. There’s no escaping it, and it makes my ears hurt. 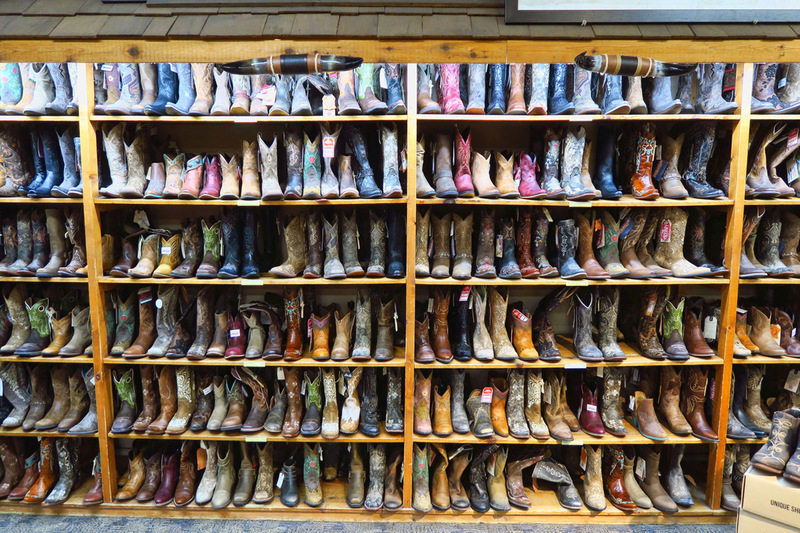 Signs you might be in a western town…. 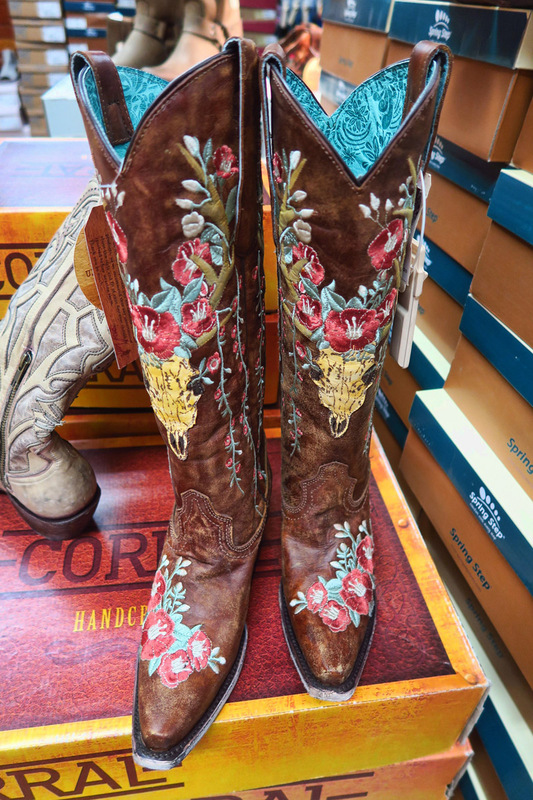 These look more like a Dallas version. Some mountain towns sell quilts. Some sell fleece. 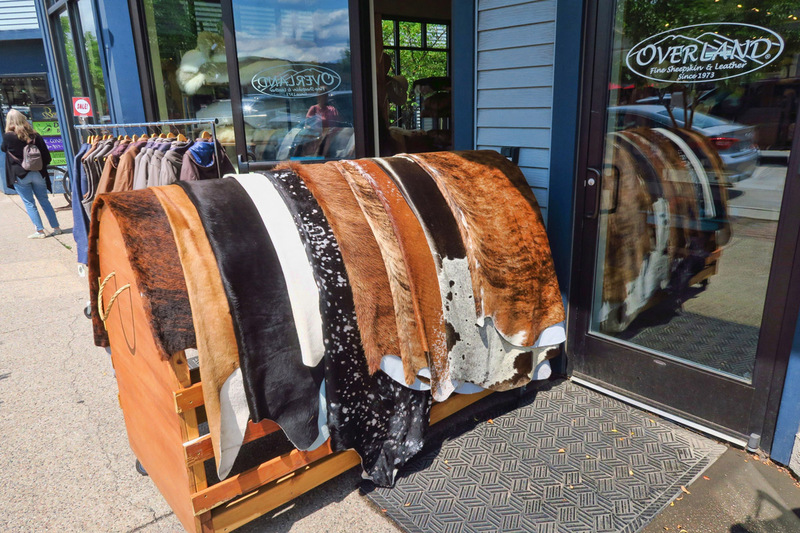 Steamboat sells animal hides. How much for the shirt? 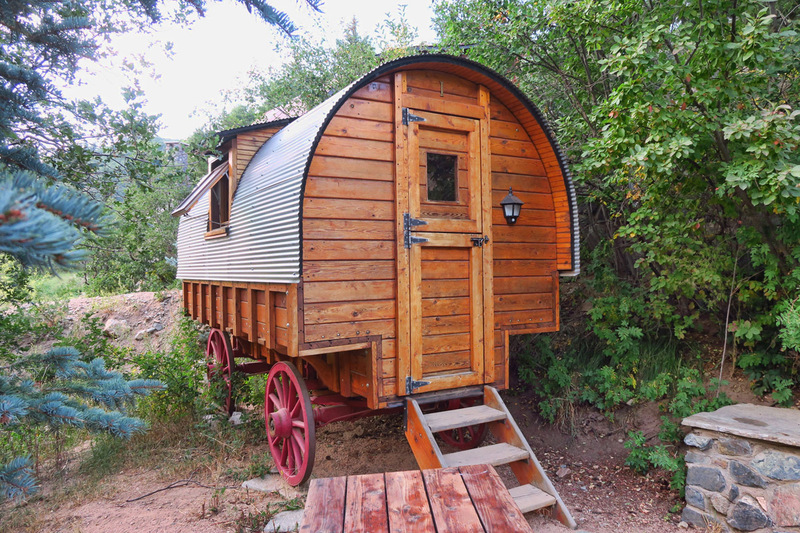 That concludes my Colorado Hot Springs round-up, as I am just about out of road…rollin’, rollin’, rollin’. 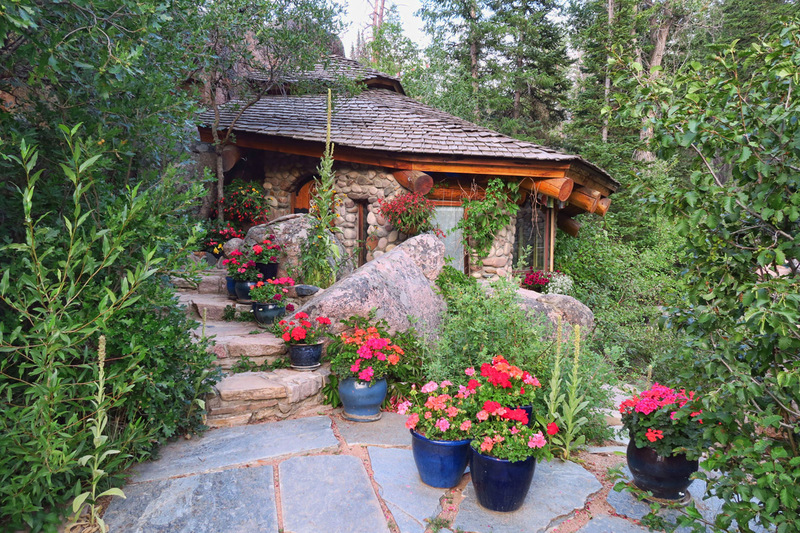 This entry was posted in Colorado and tagged Hot Sulphur Springs, Old Town Hot Springs, Steamboat Springs, Strawberry Park by Suzanne. Bookmark the permalink. 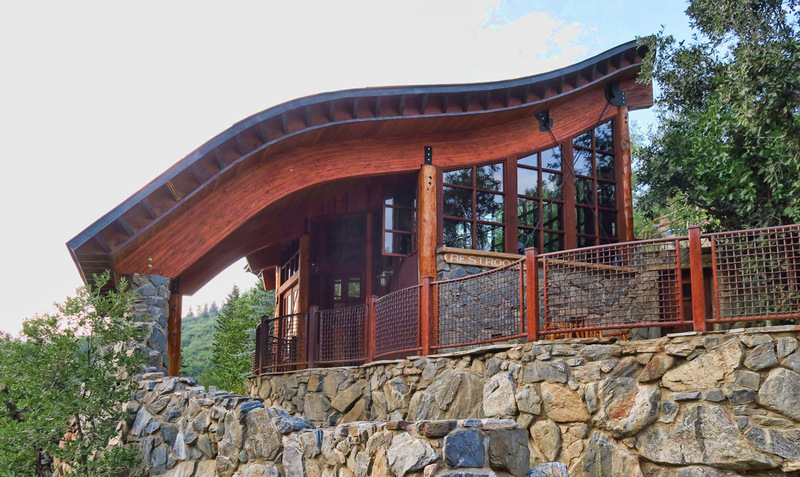 Love the beams on that bathroom building! Hi, John. It was a beautiful structure, inside and out! I can feel the heat from here, nice blog. What lovely stops you made! I have noticed more & more so, while out birding, any free area of say, one of the local lakes is where, a lotta times, I get a creepy vibe that I don’t need to be there alone. A sign of the times I suppose. Sigh. 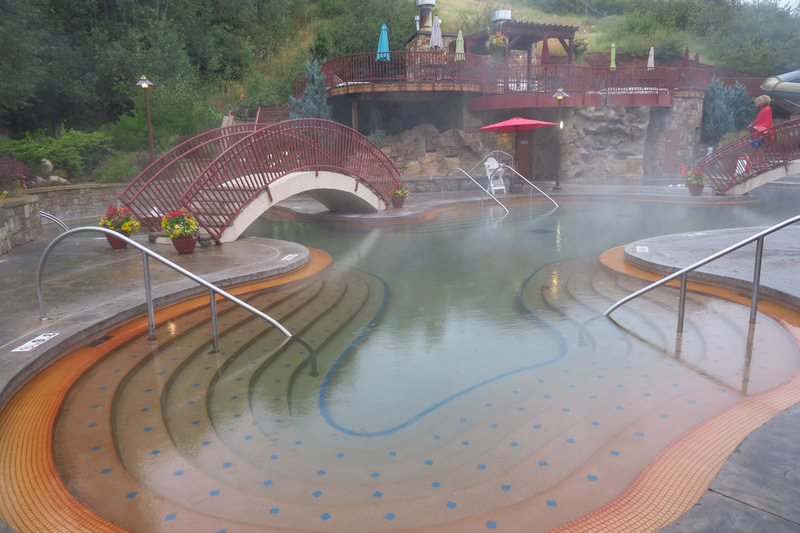 Those are some beautiful hot springs, 104 is about as high as I can go for any length of time. I love the rule about children only being allowed in certain pools downstream of the others. More should do that! Suzanne, I read every blog post you have. Planning on doing Colorado next spring in search of relief from post hip surgery. 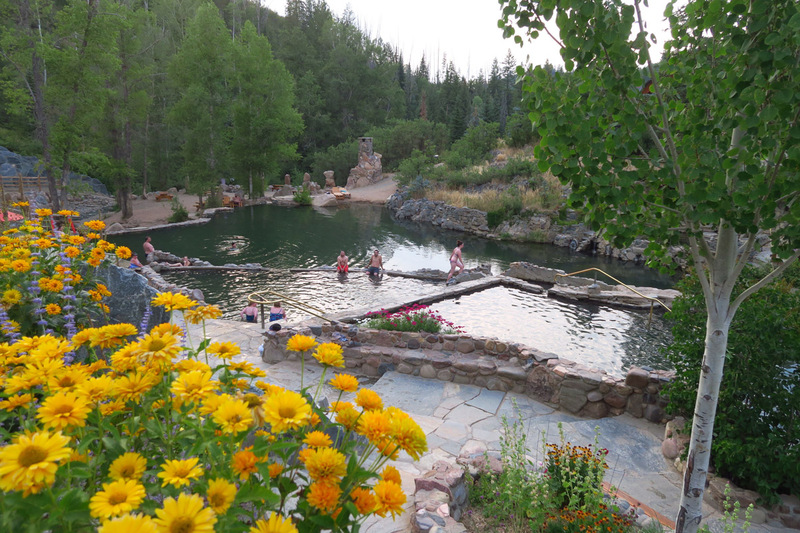 Your last several posts on the various hot springs have been an invaluable source of knowledge for future planning. Thank you for that as well as all your other informative postings. Look forward to them weekly. 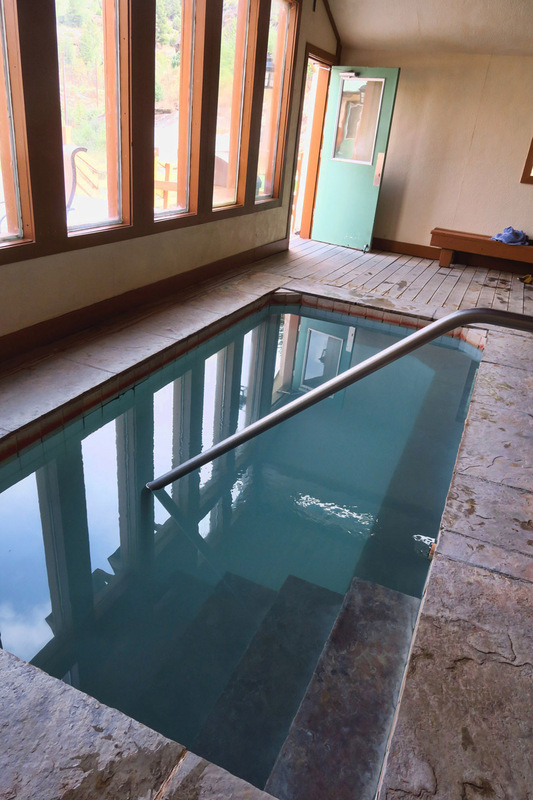 Thank you for the Colorado hot water travel reportage. We have not spent that much time in the state, we may have to give it a shot. This is an awesome write up. Can you list the other six you visited?